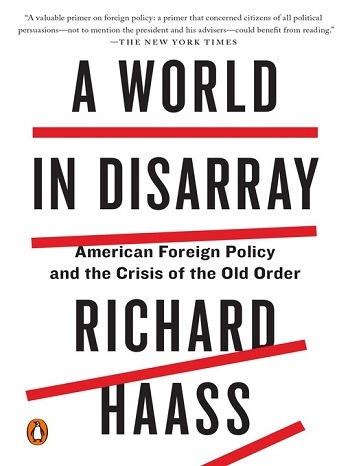 “Disarray” is the dominant characteristic of 21st century international relations, argues Richard A. Haass, president of the Council on Foreign Relations since 2003. This means “some rivals are sometime partners,” and joint efforts are essential to deal with common challenges, Haass explains in A World in Disarray. A distinguished foreign-policy practitioner who is now the president of the Council on Foreign Relations, Haass overviews the history of international relations from the Peace of Westphalia through the end of the Cold War, analyzing key foreign policy challenges and advancing recommendations for United States and other countries for dealing with the world’s disarray. The first three chapters explore the dynamics of international relations before 1990s, when balance of military power and economic independence was a guarantee against disarray. The Cold War could be a transformational period, in which American unipolarity “never really existed,” and “the enemy of your enemy is not necessarily your friend.” During this period, US foreign policy, especially national security, has been “guilty of a geographic bias that constitutes a strategic distortion.” For instance, the United States devoted major efforts into the Middle East and yet, at the global and local levels, demonstrated limited ability to “translate its clear advantages in wealth and military power into influence,” offset by the relative advantages of potential competitors and rivals, including terrorist and extreme groups. The second of three sections focuses on international relations of the post–Cold War era, a transitional period with “increased globalization and increased regionalization,” and according to Haass, a departure from the past four centuries. He describes the era as “nonpolar” rather than “multipolar,” a world dominated by several principal powers with wider distribution of power and influence. He adds that “power is more distributed in more hands than at any time in history” and numerous non-sovereign actors share power and influence with the principal powers. Based on many cases, Haas stresses the realms of international relations involving numerous actors – like cyberspace, public health and nuclear proliferation – and explains the reasons for the disarray that has emerged in the post–Cold War era, including governments prioritizing short-term interests over long-term goals. Haas maintains that “little in history is inevitable,” and in the final section, advocates the concept of “sovereign obligation,” referring to “a government’s obligations to other governments and through them to the citizens of other countries” with “realism updated and adapted to meet the exigencies of this global era.” He presses this point: “Governments would have the obligation not just to avoid engaging in prohibited activities but also to do everything in their power to prevent other parties from carrying out those activities from their territory.” The United States and other nations have undertaken huge efforts on sovereign obligations – from the US war on terror to China’s One Belt, One Road. But such endeavors are time-consuming. Such goals can disrupt internal trajectories for any country and create a new source of risk for triggering unilateral actions or resorting to military force. US foreign policy has long been characterized by an openness to immigrants and trade, as well as longstanding commitments to allies. For Haass, dysfunctional politics, particularly “frequent reversals run the risk of unnerving friends and emboldening adversaries.” Interviewed for the Financial Times after his book’s publication, he refers to Trump administration striving to overturn many policies of his predecessor: "a lot of people are new to government and foreign policy” with “competing centres of authority inside the White House." Haass challenges conventional views on international relations in a global setting, but readers from around the world inevitably will disagree with some of his conclusions. Other challenges emerge as governments fail to keep up with swiftly developing technologies, and Haass’ book does not address the deep web, a new security challenge and source of global disarray. Substantially larger than the surface internet, the deep web encompasses parts of the internet not indexed or revealed by search engines for multiple reasons. The deep web contributes to instability with false documents, espionage, weapon smuggling, drug and human trafficking, and other nefarious activities. The gap between global governance and challenges generated by the deep web may be widening. The deep web is largely accessed by Tor, a software project created by the US Naval Research Laboratory to “allow political dissidents and whistle-blowers to communicate without fear of retaliation,” as explained by Vincent Hoang. And a team of scholars wrote an article to present “selfrando” – “an enhanced and practical load-time randomization technique for the Tor Browser that defends against exploits.” Now, it’s largely impossible for police and intelligence units to track users of the deep web, and the number of users and the scale of illegal activities are unknown. How can the United States and other countries survive the world in disarray? Haass prefers to “greater integration and cooperation between government in the realms of law enforcement and intelligence sharing.” It means a package solution, including but not limited to sovereign obligation advocated by Haass along with global governance, intern-governmental cooperation and public-private partnership. A state should adopt solutions in accordance with the corresponding context. Kai Chen is an assistant professor at the School of International Relations, Xiamen University, and the author of Comparative Study of Child Soldiering on Myanmar-China Border: Evolutions, Challenges and Countermeasures (published by Springer).